Blend the biscuits, transfer to a bowl, add butter, stir and put the mixture into 4 ramekins as a base lined with tissue paper and transfer them in the fridge. Meanwhile, whip the cream with 3 tablespoons of sugar, add the philadelphia and mix well together, blend the raspberries with two tablespoons of sugar. 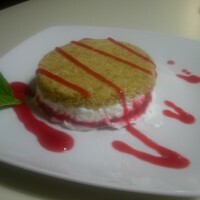 Take the molds with the base of biscuit, put a layer of cream, finished with a raspberry and cream. Put in refrigerator to cool for at least 2 hours. Decorated with the raspberry puree and a mint leaf.